If you switch around the letters in the word PETS you get PEST. I’m looking at you Roger you little mutt. Granted, I’m writing this after getting up with this dog no less than four times last night. In his defense, he had an upset stomach. Treating the cat’s litter box like an all-u-can-eat buffet will do that. By the way, how purrrfect is this t-shirt my daughter is wearing? I saw it and had to buy it. 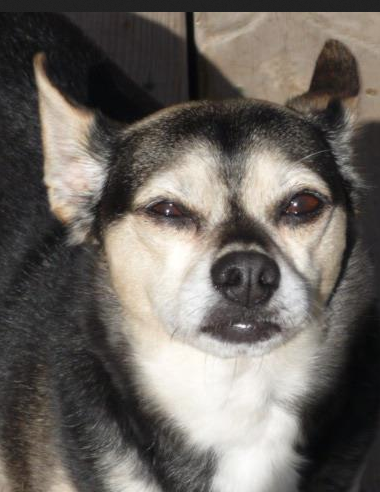 It’s basically our cat wearing glasses with our exact dogs reflected in the lenses. What are the odds? Alas, after five cups of coffee I have decided to forgive Roger. This lovable dog has brought so much joy to our family, it’s hard to stay mad at him for long. In fact, as I’m watching him right now all curled up at my feet I feel somewhat guilty for going all alpha on him at 4AM. I’m not my best self when I’m sleep deprived. The other robber of sleep this week is our cat. Kevin has been embracing his nocturnal side and waking me up at all hours of the night to ‘suggest’ I feed him or to just lie on my face. We’ve never had a cat so we’re on a bit of a learning curve. Litterbox protocol, kitty food, the ongoing outdoor/indoor cat debate, weird meowing, insect stalking, unprovoked pouncing, sandpaper tongue licks… this is all new pet territory. 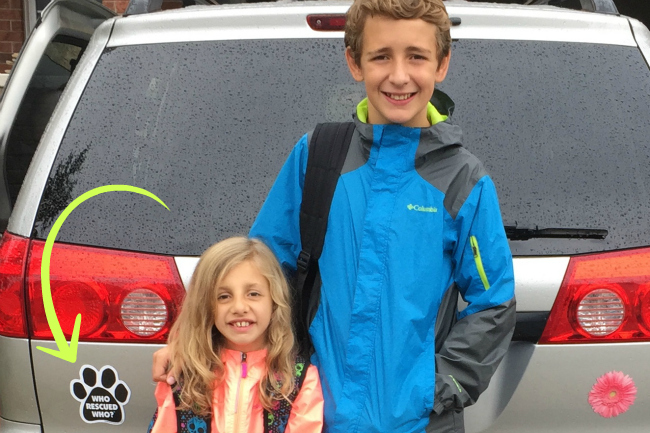 You can read about why we got a cat in the first place. My apologies in advance for the scary/hilarious photo of my brother/cat hybrid. I can deal with scooping poop out of sandbox in my laundry room. I can handle the occasional hive or sneeze resulting from fur up my nose. I am okay with being spontaneously licked, pawed and/or sat on. The thing I can not accept is my sleep being disrupted by these animals living under our roof, roof (see what I did there?). I’m exhausted and clearly making super lame pun choices. Anyway, I have come up with a few options. 1. Sleep in my car. 2. Take these fur balls on a one way drive to the pound. 3. Switch up our bedroom door with a soundproof metal door. 4. Stay awake all night and sleep all day. So here’s what I’m trying instead. c) Make sure his fluffy blanket is in his upstairs bed since he’s like a toddler who can’t sleep without it. I can’t keep Kevin out of our room—we have to keep our door open to be able to hear our daughter (long story). I can fall back to sleep after he pops in to say hello, but when he starts meowing at 5am to be fed, well that I can’t ignore. Luckily, we have found a solution and it’s freaking life changing. We set up an automatic pet feeder! We’re using the Eatwell 5 Meal Pet Feeder and it’s outstanding. It’s battery operated and has five portioned sections for Kevin’s kibbles. of the pre-filled food sections = satiated cat & well-rested cat owner. As long as you make sure the batteries are always charged and the sections are filled with kibbles, you can rely on this feeder to feed your pet for you every day. You’ll notice we put the feeder up high on the counter so Kevin (I had no idea cats can jump so freakishly high!) can access his food and dine at his leisure without the risk of Roger eating his food. 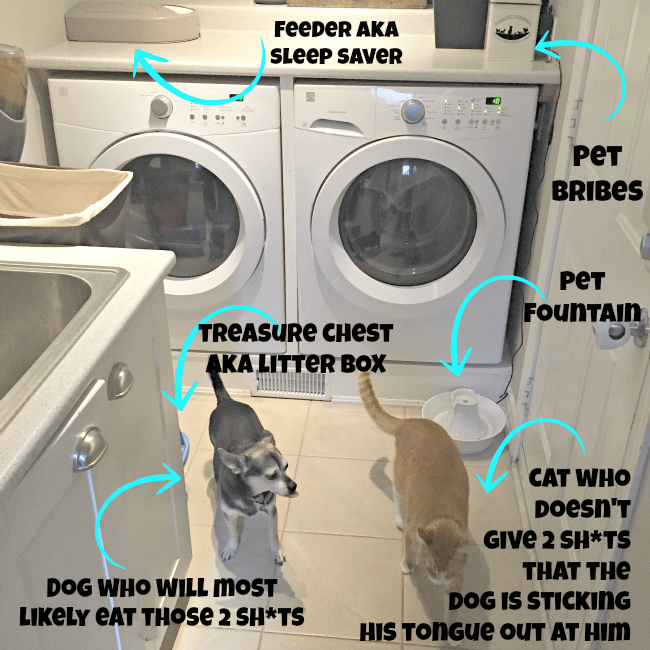 And… to ensure they always have plenty of fresh water, we’re using a Drinkwell Avalon Pet Fountain in their animal lair (aka our laundry room). Roger will go a whole day without drinking from his regular water bowl. But, put him outside and he’ll happily drink from our ornamental garden fountain—the one with stinky pond scum scented water. Gross. Between the mildewy water and “cat treats” his breath can peel paint. Anyway, this fountain is FABULOUS! Since the water is pumped through a charcoal filter and is always moving, it’s super fresh. Pets can drink directly from the bowl or lap from the waterfall. I found these pet items at PetSafe and needed to try them. I contacted the company directly and they kindly sent these for us to test out. We give both of products two paws way up! Petsafe has some really unique and useful products for pet lovers. You can check out their pawsome site at petsafe.net. If you love pets (and really, how can you not?) 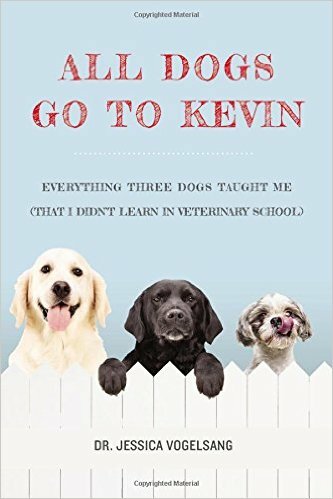 you’ll love the book I just read called All Dogs Go To Kevin. 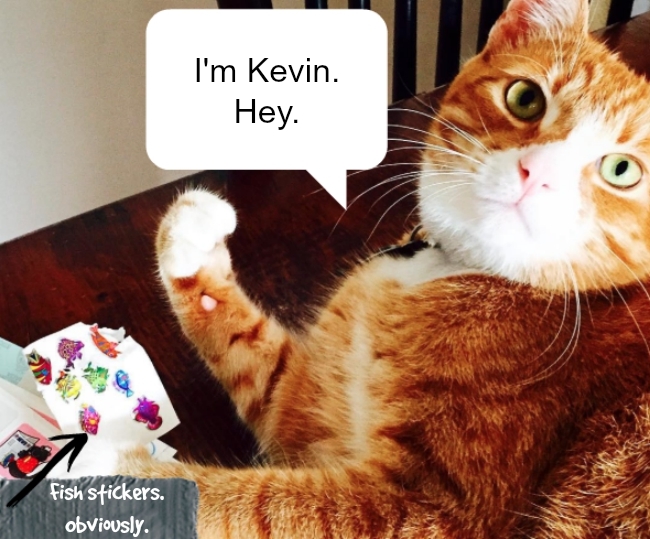 (Why yes, I do have a cat named Kevin…). I cried several times though. No surprise there. We pet people are a sentimental breed. It’s written by veterinarian Dr. Jessica Vogelsang—it’s her story, both personal and professional. The book left me with regrets that I didn’t pursue my dream of going to vet school (too much math and a paralyzing fear of blood got in my way I’m afraid), but also with a great appreciation for like-minded people who appreciate the humour, love and joy that pets bring to a family. I’d love to send you a copy of All Dogs Go To Kevin!! (It would make a great gift for the pet lover in your life, a tween/teen dreaming of going to vet school, or for the veterinarian who takes care of your fur babies). Enter to WIN your copy of the book at the end of this post. On a final furry and funny note… this Amy Schumer skit! Seriously, if you haven’t seen it, you have to watch it. I howled. The dogs did too. My rescue dogs. I’m not kidding when I admit that we have a “Who Rescued Who?” magnet on our mini-van. I thought it was sweet, but now I can’t stop laughing whenever I look at it. Don’t Answer This Call—It’s A Scam!